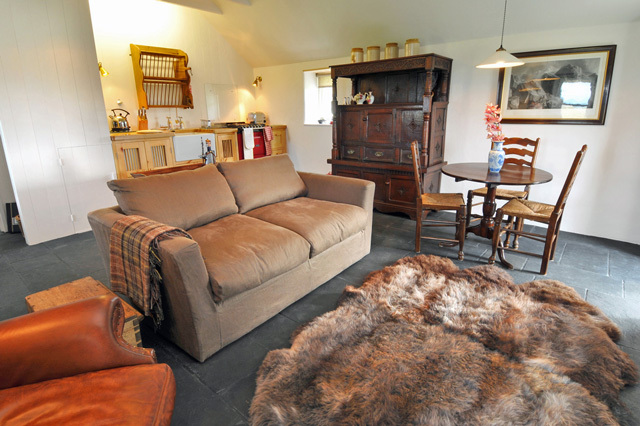 Tigh Nighean Bhan, Holiday Cottage, Isle of Skye, Scotland. 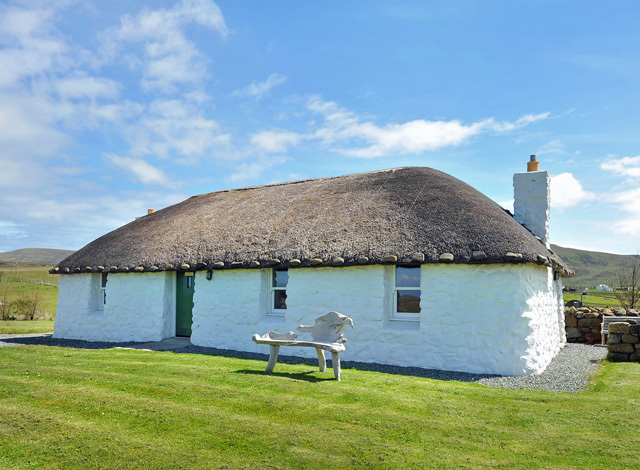 Tigh Nighean Bhan is a beautiful restored thatch blackhouse with superb views of the Western Isles located in the breathtaking north end of Skye and perfect for a luxury romantic holiday or honeymoon. 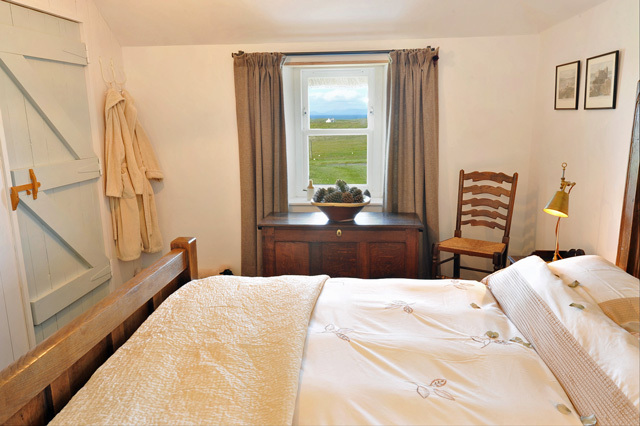 Set in the dramatic Trotternish landscape this holiday home for two will afford stunning sunset views, a high level of interior luxury combined with the opportunity to freshen up with a local walk to suit all abilities in the surrounding countryside. Tigh nighean Bhan is situated in the tiny crofting township of Bornesketaig - a small, friendly community located within the coastal township of Kilmuir, not too far from the ferry port of Uig, where you can sail to the Outer Isles - Regular services to Tarbert, Harris and Lochmaddy, North Uist and the handy option for day trips and connections to other parts of the Isles. Uig amenities include a general store for groceries, a garage, cafe and restaurants while more enhanced services such as supermarkets, shops, restaurants and visitor attractions can be found in Portree, the island’s capital some 20 miles south. Tigh nighean Bhan, (pron: Tie nee-an Van) 'house of the fair lady' was designed by award winning architects Rural Design and the cottage and its interiors were created to be spacious and luxurious whilst retaining the character of a traditional thatch. It was originally built by the church as a reading house and inhabited after that by a lady with long blonde hair - hence the name. It has received much media attention having featured in several magazine and press articles, as well as being filmed for television. 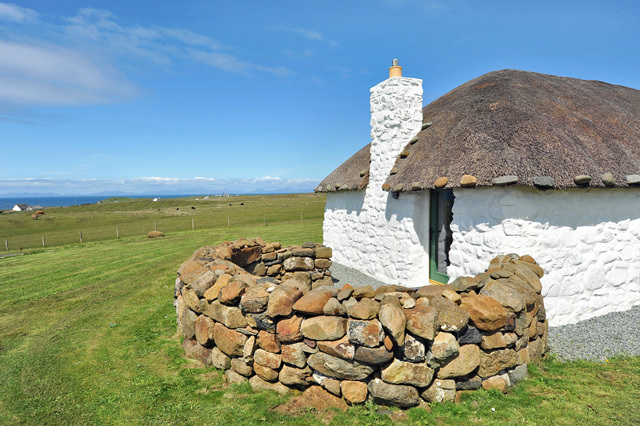 It has been carefully rebuilt and restored to retain the atmosphere of the original blackhouse with thick stone walls and traditional carpentry throughout. Modern day luxury and convenience are combined with natural materials such as the Harris Tweed curtains to provide stylish and comfortable accommodation. 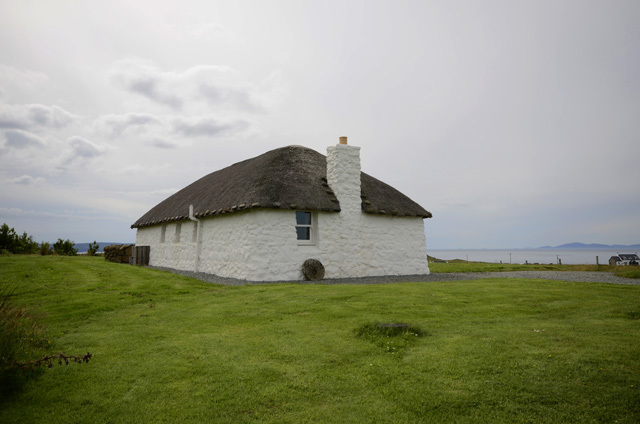 Following the floor layout of a traditional blackhouse Tigh nighean Bhan provides a spacious bedroom and bathroom together with an open plan living room, dining and kitchen area. The living area encompasses a comfortable seating area with TV and hifi subtley concealed in a hidden wall cupboard. 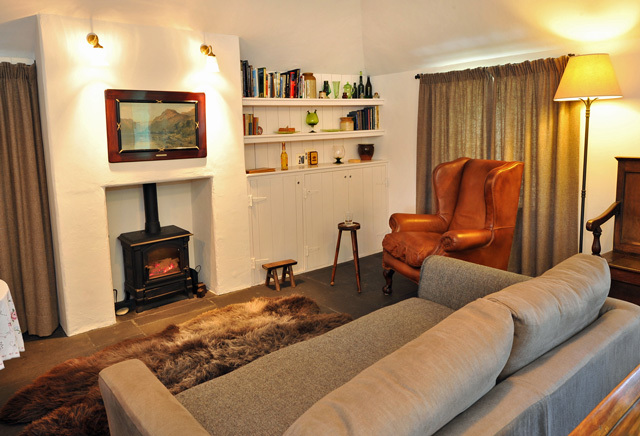 A high wing backed leather armchair is ideal for reading one of the vintage books or local walking guides you’ll find in the cottage and the stove creates a perfectly cosy setting for an evening in. The kitchen has all the modern equipment you should need to prepare your own culinary delights should you not wish to visit one of Skye’s many outstanding restaurants. 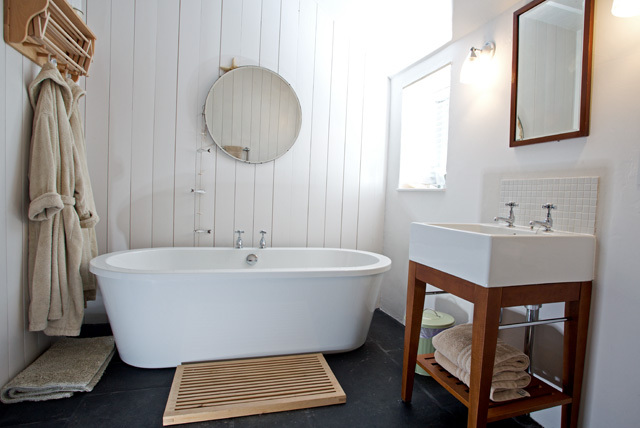 The bathroom which includes a bath and separate shower is set with luxurious towels, bathrobes and locally produced Skye soap toiletries. Venturing outside, you’ll find a semi-circle dry stone wall that provides a sheltered seating area to admire the stunning sunset views - arguably the best on the island! 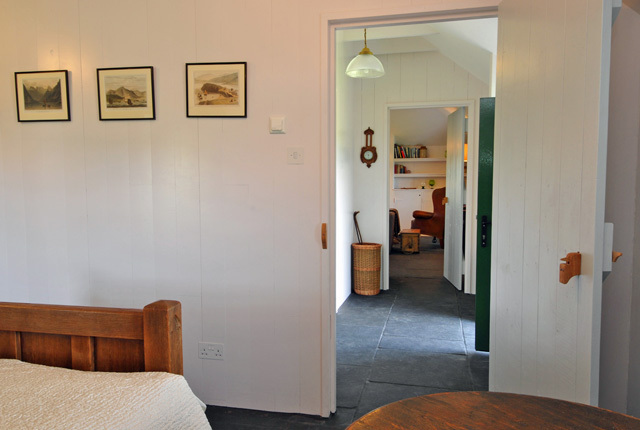 If you’re looking for a relaxing holiday for two in a beautiful traditional cottage that provides a cosy base from which to explore fabulous island countryside then you’ll find that Tigh Nighean Bhan will be the perfect choice. 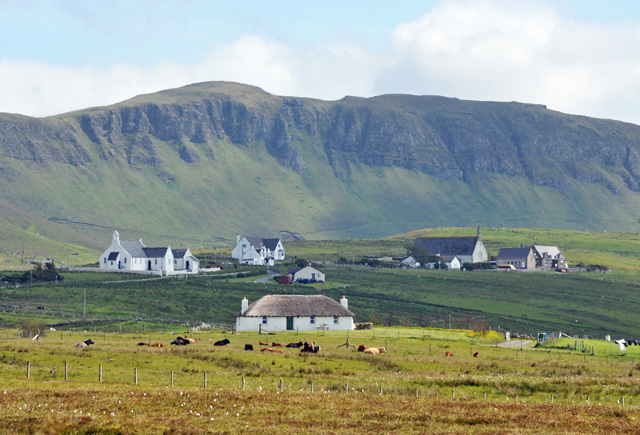 The surrounding area is beautiful, and offers something for everyone - from the dramatic mountains and rocky coastlines to the traditional crofting villages of the north of Skye. This northern part of the island is one of the most impressive and picturesque parts of Skye and boasts superb opportunities to enjoy some walks in the finest countryside including The Quirang, The Old Man of Storr and Kilt Rock to name a few. The local jetty at Camus Mor provides kayak or canoe access for the adventurous or just a place to explore the beach for driftwood. The location also gives an opportunity to spot wildlife, try whale watching or keep an eye out for otters down at the shore. People travel the world to see and hear Skye’s many resident rare birds - Golden Plovers, Curlews, Fulmars, Kestrels, Little Grebe, Corn Crakes and Skylarks. Sea eagles that nest on the high cliffs around the Trotternish peninsular close by can be spotted soaring above. Guides are available for climbs in the Cuillin Mountains and a local Ghillie can take you Fly Fishing. Skye’s outdoor centre - Whitewave is just a few miles away offering kayaking, canoeing, archery, mountain boarding, hill walking and climbing activities. Open plan lounge, dining and kitchen area, sandstone floors. Living area with comfortable seating, gas feature stove, Satellite TV, DVD, CD/radio, iPod docking station. Fully fitted kitchen, electric Aga with gas hob, fridge with freezer box, microwave, dishwasher, washer/dryer, and all the usual kitchen equipment, dining table and seating. Bedroom with antique oak king size bed, harris tweed curtains, vintage furniture. 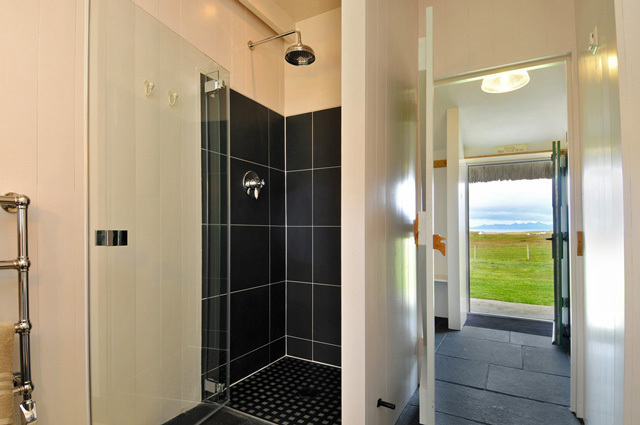 Shower room, sandstone floors, walk in shower, free standing bath, wc, whb, heated towel rail. Luxurious cotton bedding and towels. Electric heating and all electricity costs. Outstanding views of surrounding countryside. We had a wonderful week in this lovely cottage even though the weather was terrible! So cosy and welcoming to come home, lots of hot water for baths and showers and lots of space to dry out our walking gear! 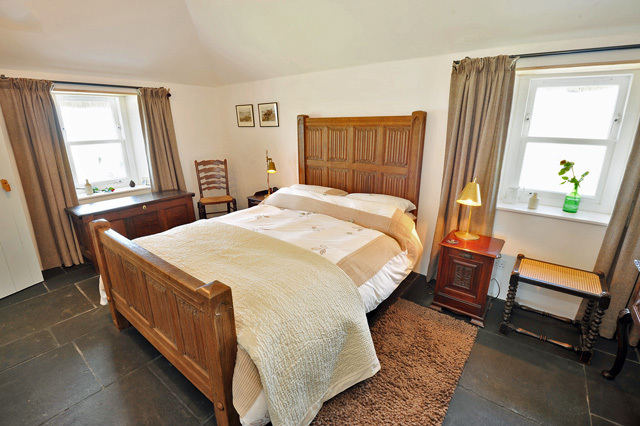 A very tastefully appointed Cottage - and really spacious for two. One very small point- maybe add two champagne glasses??! Oh, and a teapot and tea cosy! We loved it/ thank you wilderness cottages! We had a really nice stay in this beautiful and cosy house. The landscape, the sheep, the sea, the people- perfect! And the weather: very scottish! The cottage is fantastic! So cozy, finished and furnished to the highest standard. I can't speak highly enough about the cottage. When booking I thought the cottage was more isolated than it was. You have a neigbour either side of you and there are houses dotted around the area. For us this did not detract from the stay. The trotternish peninsula is beautiful. We explored the whole Island and thought the cottage was in the best place. If we could add anything, WIFI would have been nice. Had the most wonderful honeymoon in this fantastic cottage, a real home from home, everything you could possibly want for cozy nights in on the fab Island of Skye. Cottage has been done to a very high standard and the little extras (wine, chocs and comp soap etc) were an added bonus. Highly recommend!